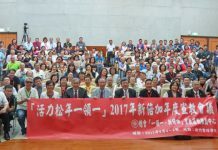 The Presbyterian Church in Taiwan (PCT) affirms the non-violent action of many students who based on their conscience, occupied the Legislative Yuan on the evening of 18 March 2014. Their motivation is to demonstrate their love for Taiwan and protect Taiwan’s democracy against the government’s lack of transparency; this student movement is symbolically known as the “Black Box” in Taiwan. At the same time, the PCT affirms the support of countless students, civil organizations and political parties from across the island which also joined in this protracted struggle. These initiatives created a momentous opportunity for Taiwan’s democratization, heightened the concern for Taiwan’s public affairs, and prevented using the economy and commerce to threaten Taiwan’s independence and sovereignty. At the instruction of President Ma Ying-Jeou, the ruling party (KMT Kuo-min-tang) Legislator, Chang Ching-Chung, co-convenor of the legislature’s Internal Administrative Committee (IAC), announced without discussion that the Pact had passed the IAC review and would be sent to the legislative floor for consideration. After the announcement, he adjourned the IAC catching the legislators by surprise. Chang’s actions are in serious violation of due process and represent the habitual bullying tactic of using majority rule to ram through measures that favor the ruling party and its business interests. Dismissing the inalienable right and privilege of the people of Taiwan, these actions are reminiscent of the dictatorship era and threaten to destroy the democratization that took years to construct. The PCT’s deep concern for Taiwan’s future is rooted in its faith. On August 16, 1977, it issued “The PCT Statement on Human Rights” stressing that Taiwan must be a new independent nation and that this future must be based on a national plebiscite. This position is also based on the PCT Confession of Faith which states that “the church is called through love and suffering to become a sign of hope”. 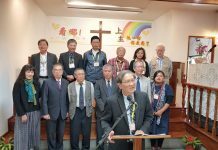 Many of PCT leaders and members participate in these demonstrations and activities to witness to their faith and to protect and preserve our country—Taiwan. 1. Affirm the students to continue their non-violent public demonstration requesting the Ma Ying-Jeou administration to rescind the trade and service pact in respect of Taiwan’s democratic rule. 2. Appeals to all the PCT leaders and members to take concrete action to participate in activities that protect and preserve Taiwan’s democracy; and to continue to pray fervently for all the young students, civil organizations and the general public involved in the demonstrations.